There are many winelovers out there who wish they could know more about wine. Consistently, I hear the comment, “Oh, I can’t tell the difference between a white and a red wine.” Okay, let’s start with colour, right? But I get it. It’s not about the colour of the wine. It’s about all that mumbo-jumbo that surrounds picking out key characteristics in wine and how those differentiate one varietal from another. At that point, I usually find myself wanting to demystify those key characteristics because, well, I’m an educator. 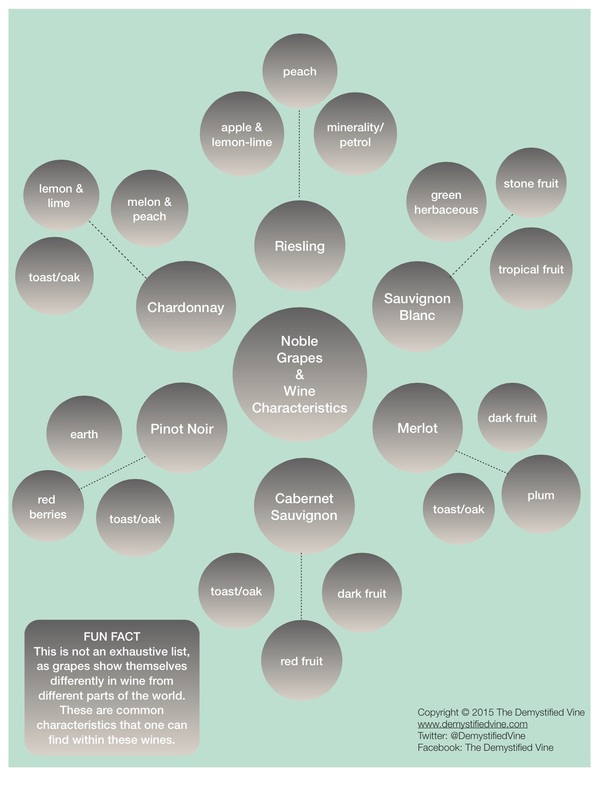 As such, I’ve created a quick reference guide for (most) of the Noble grape varieties. Noble grapes are also known as “Key Grape Varieties”. Syrah is considered to be a key grape variety as well, but I couldn’t work it into my web. Shout out to Syrah…you know I love you! For those of you not entirely well-versed in wine, use this to help you on your wine journey. Please note that this is not an exhaustive list. There are many more characteristics used to describe these individual wines. The characteristics I have included are the most common for each grape and how that grape shows itself in its final product. Enjoy, and remember to “like” the Demystified Vine on Facebook for fun facts, memes, and other wine-related articles.